Henri de Toulouse-Lautrec (November 24, 1864 – September 9, 1901) began drawing at a young age, at the family estate in Albi in southern France, when illness and injury kept him unable to participate in the typical activities of the era’s gentry. His disproportionately short legs, in comparison to his torso, were caused by a poorly healing broken legs, the result of a genetic defect. A family friend who painted the fashionable sporting pictures, was engaged as his first art teacher. His physical handicap influenced his outlook on life, leading to a lifestyle which included alcohol abuse, which eventually killed him, and a sympathy and affection for those marginalized in society, such as the prostitutes who became models for many of his famous works. In 1882, he moved to Paris, and following a period of painting en plein air following techniques of the Impressionists, he began to explore modern techniques in printmaking. Settling in Montmarte, the Parisian area known as the home to artists and writers. There he created art that mirrored his bohemian life. He met and exhibited with Émile Bernard and Vincent van Gogh. He became one of Paris’s foremost printmakers, focusing on the subject of the city’s burgeoning night life and helped to expand the popularity of the advertising lithograph. When the cabaret Moulin Rouge opened, he was commissioned to paint a series of advertising posters, as well as posters promoting famous nightclub singers. He traveled to London, where he befriended Oscar Wilde. He was influenced by Japanese woodblock prints which featured strong outlines and bold flat colors. Through his prints, he sharply depicted the personality traits of the day’s performers as well as sympathetically portraying the humanity of prostitutes. 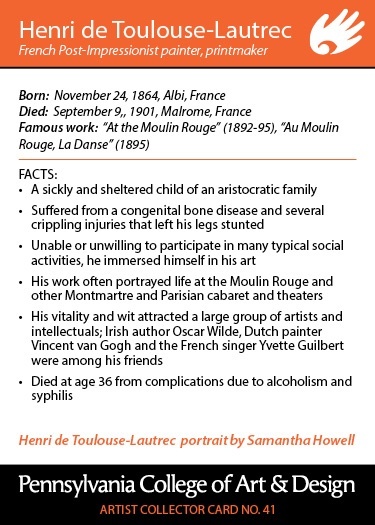 By 1899, Toulouse-Lautrec collapsed from exhaustion and the effects of his alcoholism. His family had him committed to sanatorium for three months where he drew 39 circus portraits. After leaving his treatment, Toulouse-Lautrec returned to Paris to paint, but his health continued to decline. On September 9, 1901, he died at the family estate, Château Malromé, in Saint-André-du-Bois at age 36. 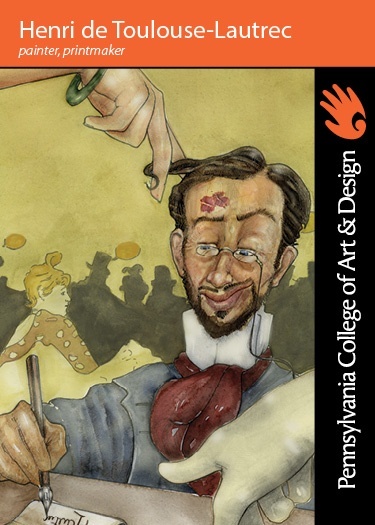 Portrait of Henri de Toulouse-Lautrec by Samantha Howell.